I will teach a 4-day workshop at Ponte Vedra Beach, Florida on January 13 - 16. We still have a few openings. Please contact Leigh Rodante at 904-280-0614 x 203 to get more detailed information and sign up. This painting project has been a hard one. I have applied a major effort to keep myself painting. I must admit that there is a tremendously powerful force around me, pushing me away from what I like to do, or what I believe is right. The world around me is keeping on make fun of me, and has pressed me to a corner. I am trying to fight, but feel lonely and exhausted. I don't know this world any more, but I feel I know myself better. Trying to be normal, to be fit in the main stream, that is my problem. "Walk your own way, ignore what other people say". Easy to say, but difficult to do. I will do it anyway, stubbornly. Happy Holidays my artist friends, and New Year is just around corner. 2017 will be an exciting year. 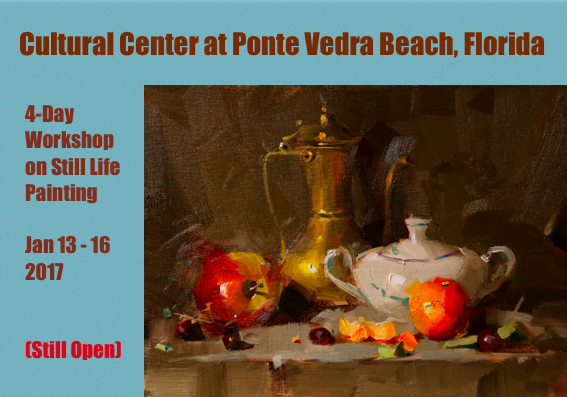 Besides doing my regular still life paintings, I will be involved in painting and teaching landscape in full swing. We have arranged an exciting 9 days painting and touring trip to Fiesole/Florence, Italy in May 2017. 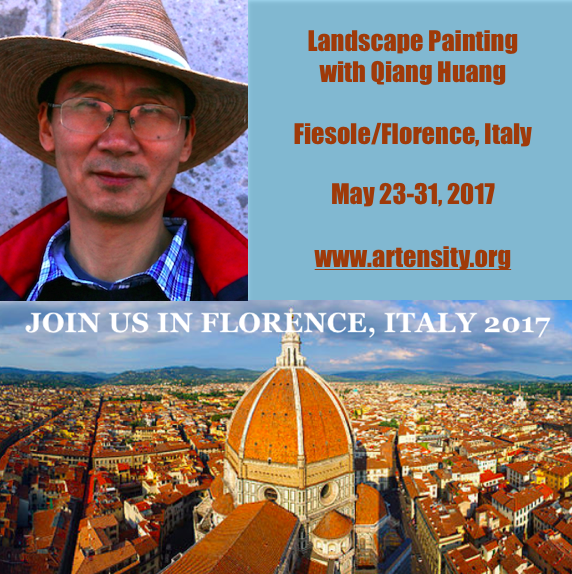 Please visit: www.artensity.org for more detailed information and sign up. "Demo at San Antonio 2016 3"
This is my third demo at San Antonio. This is my second demo on my Coppini Workshop. I have spent quite a long time to model that brass candle holder. 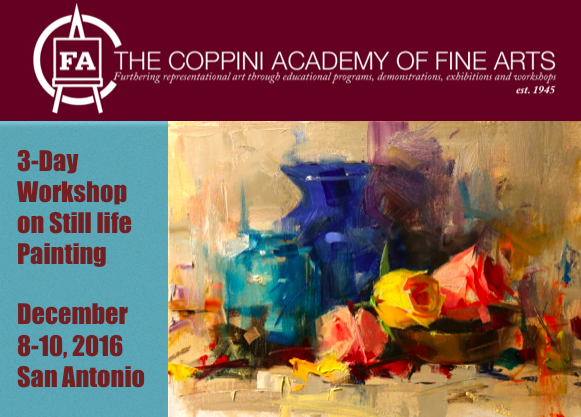 "Demo at San Antonio 2016 1"
My last workshop of the year was at Coppini Academy of Fine Arts in San Antonio Texas. I want to Thank Tony Pro and Andrew Van Degoede for organizing this workshop, and thanks to all the Texas artists for attending. This is my first demo and this painting is still available. This is my last demo, which is high key with roses. High key gives more opportunity for using colors. However, I personally still like low key better. Low key painting show more mystery with light. My second demo is about painting metal and glass, but I really like the orange peel given an unique form. I have just finished teaching a workshop at Baton Rouge LA. I want to thank Carolyn Breaux for organizing and want to thank all the Baton Rouge artists for coming and painting with me. This is my first demo. I have had a great time at Baton Rouge. Especially I want to thank Carolyn and her husband Jack for their warm hospitality. They kindly offered their home for me to stay and treat me delicious cajun food everyday. I have enjoyed so much these a few days. Second demo at Putney. Feels the light is coming from a warm candle flame. It was cold and snowing here at Vermont. After dark, setting in front of a warm wood stove. It was very cozy. "Demo at Putney 2016 1"
My workshop at Putney VT has started, and this is my first demo. I am so excited coming back to Putney and want to thank Penelope and Capt. John for organizing my workshop. Thanks to all the artists for attending. “Demo at Granbury 2016 3"
My third demo on the Granbury workshop. Now the workshop is over. We have gone through a lot. I hope all the workshop attending artists practice what We has discussed. I am looking forward to seeing the progress in your art. Now. I am sitting at the Ft. Lauderdale airport waiting for my flight bring me to my next destination. "Demo at Granbury 2016 2"
This is my second demonstration on the Granbury workshop. It is the pumpkin season now. I have started my workshop teaching after I returned from China. I want to thank Vickie Guthrie and the Lake Granbury Art Association for organizing this worksop, and thanks to all the artists for attending and paint with me. It is always wonderful to see old friends and meet new friends. This is my first demo. You have seen I use my social media to let people know where I go and teach workshops, but some how I forget to announce the workshop in the place I call home. Well, I hope it is not too late. 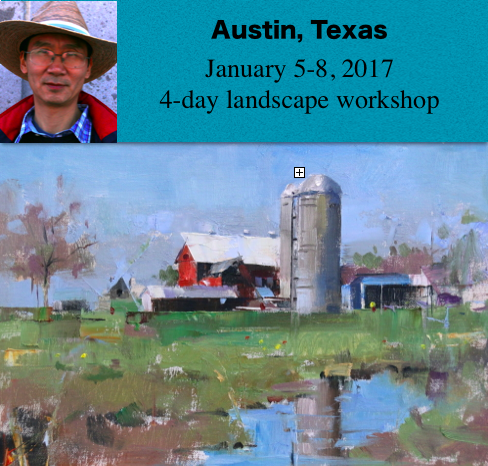 Right after the New Year of 2017, I will teach a 4-day painting workshop at the suburb of Austin. For this one I will concentrate on landscape painting: both plein air and using reference photos. Please visit: http://www.qh-art.com/qiang-huang-austin-workshop-2017.html for detailed info and sign up. I am looking forward to paint with you and share what I know about art. 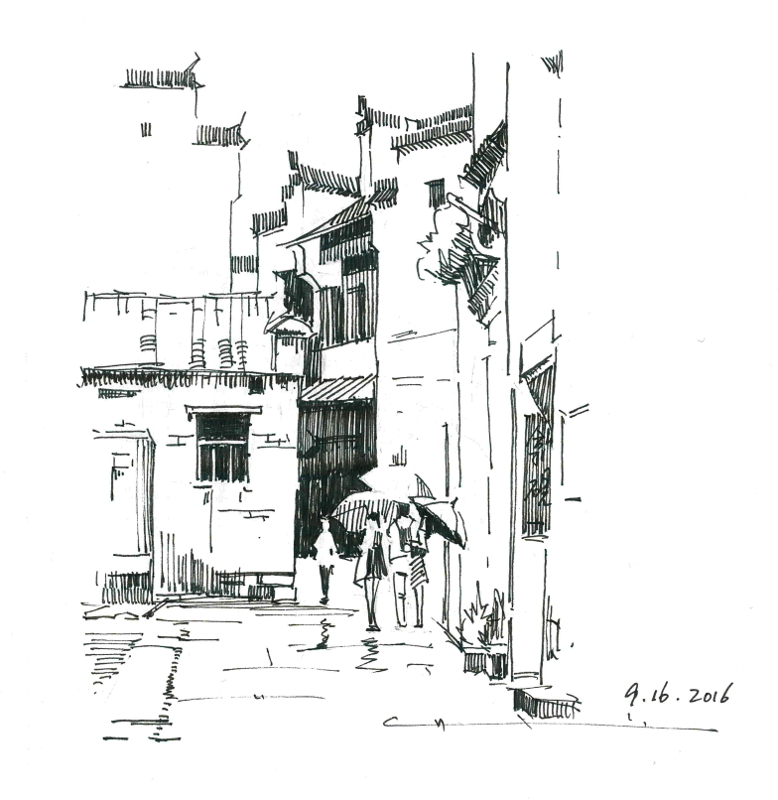 “Xidi in the rain 2"
This is another pen-&-ink sketch of the Xidi village. I like this medium, it is rather convenient and less time consuming. I did quite many this kind of sketches when I was in China. Using line structure to depict the scene has a special beauty. I want to explore more in this kind of work when I get more time. This is my first painting after I returned to the States. For a while, I have been testing new painting experiments. I was told I should come out of my comfort zone and try new stuff. I tried using more high key colors, splashed impressionistically, and even limited myself into monochromes. I used more knifes to sculpted old architectural structures, and doing more plein air landscapes. My art journey has been turned into a drifting wandering. My work sometime is satisfactory, but more often they are mediocre. Of course, it is normal, because I am doing something I have not been experienced with. Well, I have kind of enjoyed this type of semi-drunk stage, but I know I have gradually lost my identity. Now I have heard a weak voice whispering from the deep part of my mind: go back. Go back to the place where you started and examine what is your first motivation in art. Revisiting the Xidi Village, I spent 5 days. I was enjoyed so much painting, sketching, and photographing the beautiful old structures. It rained quite a bit there, but the rain bring special beauty. The figures bring high chroma color on the black and white buildings giving the contrast of color vs non-color, young vs old. All of these photos I may use for my future paintings. "Xidi in the rain 01"
I made two trips outside of Beijing. My first one was to Auhui province. Xidi is an old village I visited last year. I love it so much so I went back. The weather wasn't cooperated much so I took many photos instead of painted at site. I did many pen-n-ink sketches. This is one of them. 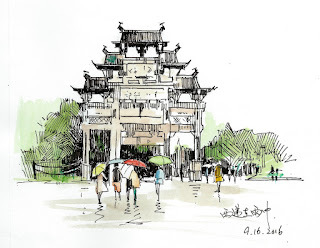 The type of structure in my sketch is called "Pai-Fong", which is a monument to commemorate someone local who contributed to the country, community, or family in an extraordinary way. The construction of a Pai-Fong must be approved by the emperor. Someone who builded it without approval would be beheaded. I am glad this genuine Pai-Fong is preserved without destroyed by commercialization. "Plein Air at Pingshan 2"
Hello My Friend, I am back to the US now. For more than a month, I have been traveling in China. I have spent time with my family, and traveled intensively, sometime with a group, and sometime by myself. Due to the difficulty of the Internet, I could not update you what have happened to me in a timely manner. Now I am back I will gradually let you know what I have done and see there. This is my third plein air painting I did in a village called Ping-Shan in Anhui province. I went there alone. but painting among so many artists. Most of them are young students having their plein air trips. The living conditions were rather difficult, but it is heaven for plein air painting. This time I have spent 5 days in Anhui, but it is not adequate. I will definitely go back in the future. Pingshan is another old village in Anhui province, China. It is not far from Xidi. I did not see too many tourists there, but many many art students. I did two plein air paintings there. This is one of them. This one is available for $400 unframed through DPW. Please click here to buy. Do you have a favorite artist who inspires you the most? Whose painting style has influenced yours the strongest? I do have mine, who is Richard Schmid. His paintings have a painterly and spontaneous look. The calligraphic design of his brush work makes his work have a special abstract beauty, which attracts me to really want to study from him. I was very fortunate for being with him a few times at Putney VT. He is very kind, down to earth, and very helpful. He has given me valuable instructions, which helps me tremendously to being my art to a higher level. Now I have started teaching painting workshops at Putney as well. Quite a few times Richard came and meet artists in my class and demo for us. Now I am going Putney again. From October 25 to 28, I will teach a 4-day painting workshop at the same studio where Richard and other Putney painters paints. I am very excited about this opportunity, and can’t wait to see Richard again. If you are interested join me and painting at the beautiful Vermont, I have a good news for you. We still have a few openings. Please contact Penelope for detail information and sign up. 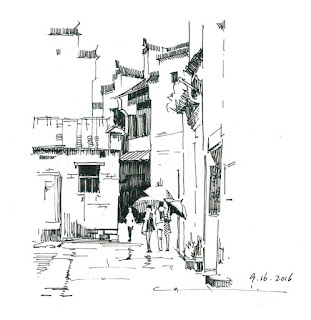 Qiang is in currently China visiting his mother and painting plein air. He is unable to post for himself at this time but he is forwarding photos of his adventures. This is a photo of his set up and the painting he just painted of the Sewing House in Xidi village. WORKSHOP OPPORTUNITY - A limited number of spaces are still available in Qiang's October 19-22 Still Life Workshop hosted by The Lake Grandbury Art Association, in Grandbury, Texas. Contact Vickie Guthrie for details and to reserve your spot. My second demo was a plein air piece. We gathered in front of one of the workshop attending artist's home. Time is limited. So I decided to paint the arbor in front of her garden. Everybody was in shade. That is most important condition to conduct a successful plein air event. At this moment I am at SFO waiting for my flight for Beijing China. I will try to keep you posted. Please wish me a luck for finding a good way to communicate there. zai-jian (bye now). I did this one as a demo for my Falmouth at Cape Cod workshop. I took the photo at Lancaster County PA in early April. I want to thank Suzy Bergmann and Falmouth Artists Guild for organizing this workshop and thanks to all the artists for attending. Cape Cod is a beautiful place. I am so happy coming back. The last demo I did at the Cloudcroft workshop was a landscape from a photo. The brown house next to the white one was the place I stayed at Cloudcroft. I hope all of you have had a wonderful summer time. I have been back to Austin for a few days now, but tomorrow I will be on my way to New England. Although I am busy traveling, but I want to keep you posted what will be here this coming fall. I know many of you are plein air landscape painters. Nowadays there are many plein air events all over the country. They are great opportunities for artists to show, sell, and win some awards. However to be successful in plein air events, you much have the skill of painting quickly. 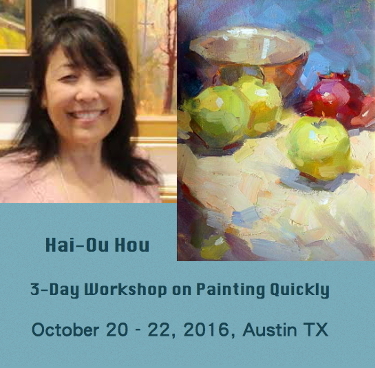 That is the reason we invited Hai-Ou Hou coming to Austin to teach a 3-day workshop on how to paint quickly. She has special tricks for finishing a painting in a very short time. Please check the detail info on the Hai-Ou's workshop webpage and sign up. We still have a few openings. The third demo, high key, many colors, sunflowers. I am at El Paso airport waiting for my flight back to Austin. I like small airports better because they provide free WiFi while most bigger airport do not. My workshop at Cloudcroft NM went well. Made quite a few new friends and had wonderful time in the Lincoln National Forest. My second demo was about painting metal in a low key situation. I have arrived at Cloudcroft NM yesterday. It was more than 100F in Austin two days ago, but last night here was 39F. What a dramatic change. I want to thank Cloudcroft Art Workshops for organizing my class here again. Thanks to all the artists from Texas and New Mexico for attending. This is my first demonstration. I was at Hood River OR a few years ago. This painting was done from one of the photos I took there. My landscape painting is still at its very early stage. I don't have much of specific techniques to depict the subtle textures of the nature. My composition is still mechanical and lack of variation. However, I like this good starting point. This new path has potential for sure. I have visited Bahamas twice and took many great photos. The painting I did today is from one of them as a reference. I had a lot of fun playing the colors for those coconut trees, and really enjoyed using my palette knife. My landscape painting is progressing. I have gained more freedom, and more dramatic effects start to show.